It has been quite chilly here the past few days. So chilly that a pot of soup was in order. I love this soup. I remember having it at a friend’s house for dinner when I was 10 years old. And in my early 20’s, I learned this recipe from Kimi. I remember one time I made this soup and E added a dried bay leaf to it —it threw this entire soup off and not in a good way. Suffice it to say it went into the trash. If you want to alter this soup in any way —please do not add a bay leaf in here. The flavor of this soup comes from the oxtail and the veggies. There’s no need for any herbs or spices. Bottoms up! In a medium size pot, parboil your oxtail for about 8-10 minutes to remove any blood. This usually results in a clearer broth. Dump the water out and rinse the oxtail. You can do this ahead of time and store this in a Ziploc bag in your freezer. Whenever you want to make soup, you can skip this step. In a 4 quart pot over medium high heat, add onions, garlic, tomatoes and oil. Cook until onions and tomatoes are soft, about 10 minutes. You should see a slight redness in color on the onions from the tomatoes. Season with salt and pepper. Add water, oxtail and carrots. Let the pot come to a boil and then turn down the heat to low. Simmer for about 3-4 hours or until oxtail meat pulls slightly away from the bone. Check for seasoning before serving. Garnish soup with scallions. This one is on my list. Looks delicious. 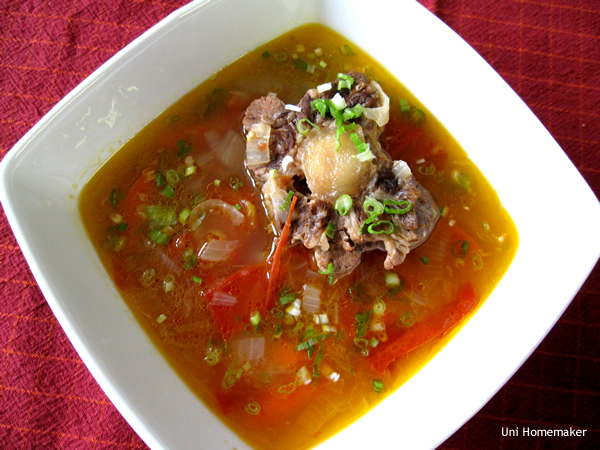 I used to make oxtail stew, I never had oxtail soup, but I can imagine that it’s delicious! Definitely the next dish I will make on a snow day! Look awesome!!! This is definitely getting pinned 🙂 mmm looks super delicious!!! I imagine this to be wonderfully comforting on a cold night! Thank for sharing your recipe.